Taken from Caribbean New Now! Published May 2, 2011. HIGH WYCOMBE, England — Dr Ralph Gonsalves, Prime Minister of St Vincent and the Grenadines (SVG) addressed Vincentian nationals, friends of SVG and other interested parties on developments in the country, at Buckinghamshire New University in High Wycombe, England. The event was attended by Sir Frederick Ballantyne, Governor General of SVG; Cenio Lewis, High Commissioner for SVG to the UK; Eloise Gonsalves; Dr Christopher Stange, Hon. Consul for SVG to Northern Ireland; Cllr Jane White, Mayor of High Wycombe; other dignitaries; nationals and the respective chairs of the various SVG National Associations in the UK. The moon is following Cecil Browne! Cecil Browne featured in the July 27, 2010 issue of the 'Searchlight' newspaper. Throughout their lives, many people harbour secret ambitions of writing and having their work published. Not only was this an ambition for Mathematics lecturer Cecil Browne, he actually achieved it! 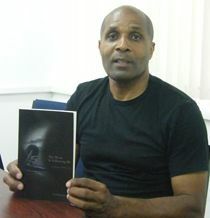 In March 2010, his first book The Moon Is Following Me was published by Matador. It is a collection of six short stories that “recalls an era when the village was the centre of life in… St. Vincent and the Grenadines”. Born in 1957, Mr Browne grew up in Chester Cottage, a village near Georgetown on the Windward side of the island. I'll have some of that, thanks!